This items is currently Made to Order. Please allow 1 week for us to make it before getting it shipped out. Thanks for understanding! 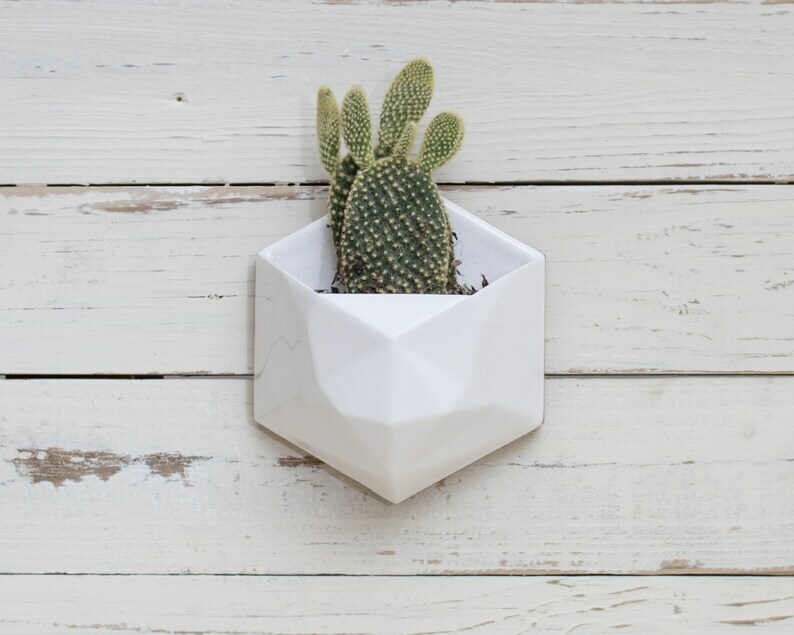 Our geometric hanging planter is perfect for herbs, small succulents and other indoor plants. Hang just one alone, or get many and make your own custom arrangements. They sit well flush or spaced out! These are a beautiful addition to any kitchen herb garden or living room that needs a bit life. Each planter is backed with wood and has a hole for hanging. The planter comes with a perfectly fit screw, although you can use any nail or screw you'd like. This purchase is for one Wall Planter. 6" x 5.125" x 3" deep. It's just deep enough to pop a store bought tiny plant with plastic pot, so you don't even have to deal with dirt if you don't want! These planters are intended for indoor use only. When watering, avoid getting mist or water onto the wood or between the wood and ceramic piece as this could potentially effect the bond over time. Small Geometric Ring Dish set of 3 in Sprinkles. Small Geometric Ring Dish set of 3 in Textured White Crawl. Large Geometric Ring Dish set of 3 in White. Small Geometric Ring Dish set of 3 in Enamel. Large Geometric Ring Dish set of 3 in Textured White Crawl.